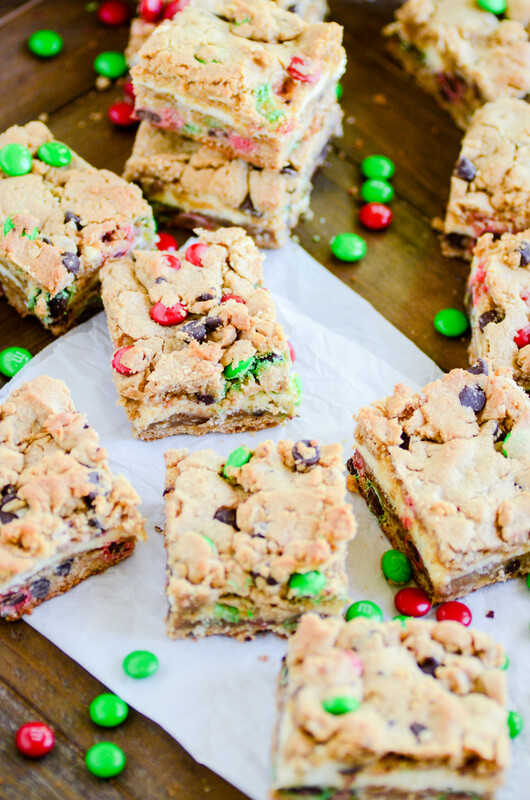 A layer of delicious, creamy cheesecake in between two layers of monster cookies. Happy Thursday everyone!!! Are you having so much fun with your holiday eating baking? I certainly am ????. I have been so excited to share this recipe with you for a couple of months! 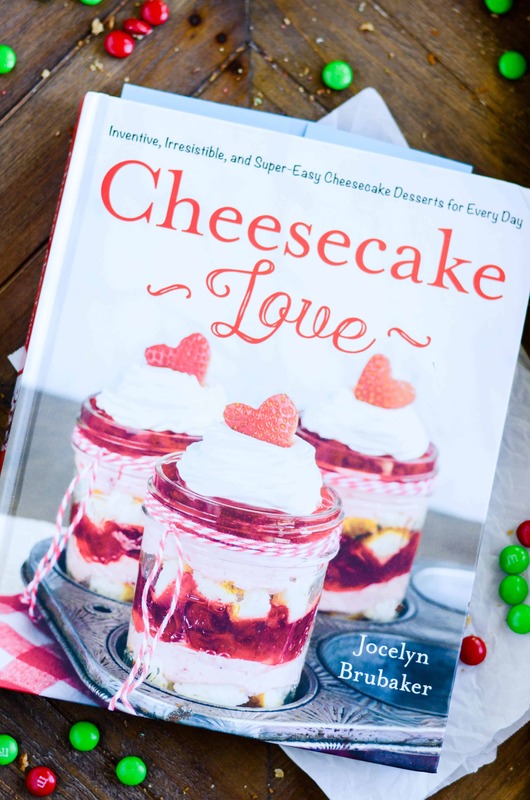 Ever since I got my hands on Jocelyn’s cookbook, Cheesecake Love. 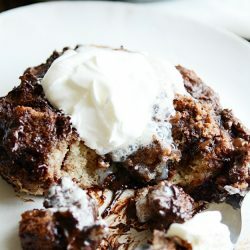 Jocelyn’s Blog, Inside BruCrew Life, is full of sweet recipes, beautiful photography, and creative ideas. And that’s exactly what you’ll find inside her bright and gorgeous cookbook. Plus, it’s cheesecake to the max! If that’s not a win in your book, I don’t know what is. There were lots and lots of recipes that called to me. 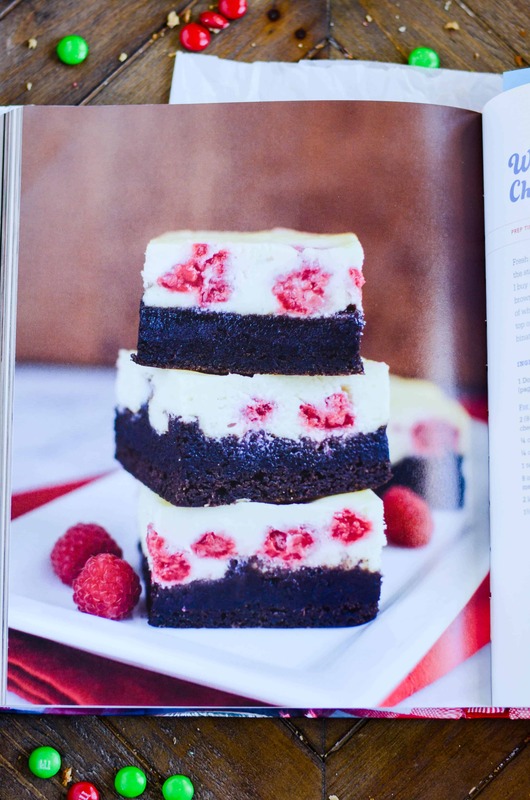 Like these white chocolate raspberry cheesecake bars with a chocolate crust. Come to mama!! But ultimately, there wasn’t a lot of deliberating as to which recipe I’d be sharing with you in this post. 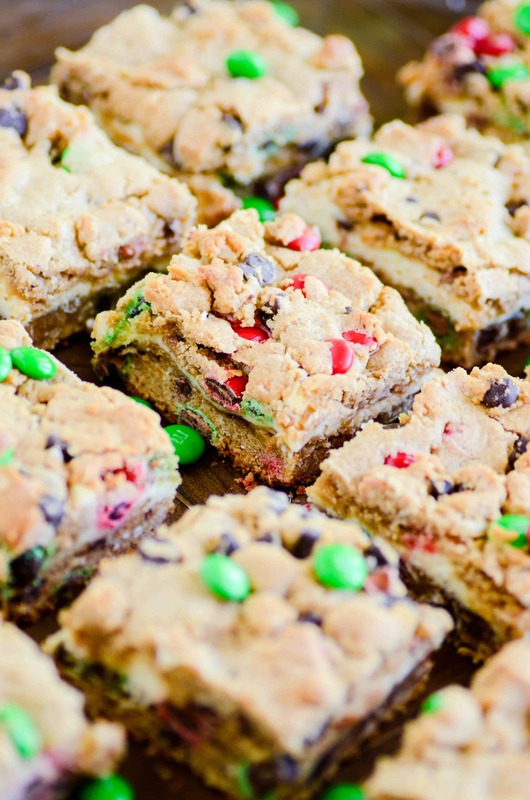 The moment I saw these Monster Cookie Cheesecake Bars, I was a gonner. You know how I feel about monster cookies— especially during the holidays. 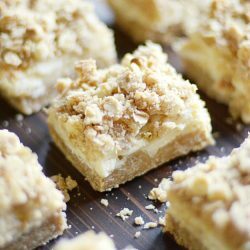 Plus, I’ve never made cookie cheesecake bars, and I’ve always wanted to. So basically, this recipe made all my dreams come true. What you’re looking at in this recipe is pretty basic (but also pretty magical ✨). 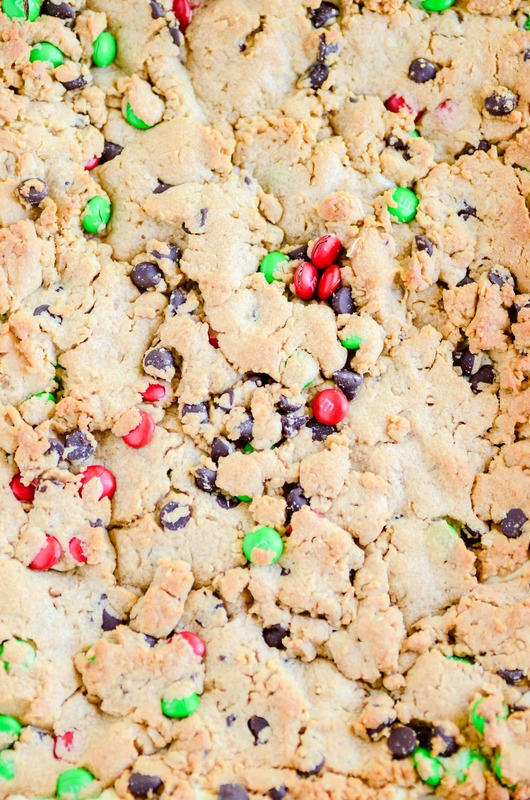 First, you’ll make monster cookie dough. 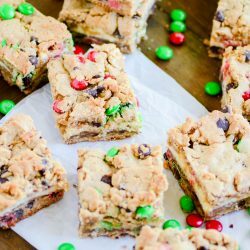 You’ll need butter, peanut butter, sugar, oats, lots of M&Ms, and a few other baking necessities. The filling is made up of my FAVORITE 3-ingredient cheesecake. All you’ll need is cream cheese, sugar, and eggs. That’s it! Now, being the cheesecake genius Jocelyn is, she also added chocolate to the cheesecake filling in her recipe. So you have that option as well. I was in a plain cheesecake mood the day I made these, so I went without. But don’t deprive yourself of more chocolate on my account! Feel free to mix 4 ounces of melted semi-sweet chocolate into your cheesecake batter before baking. 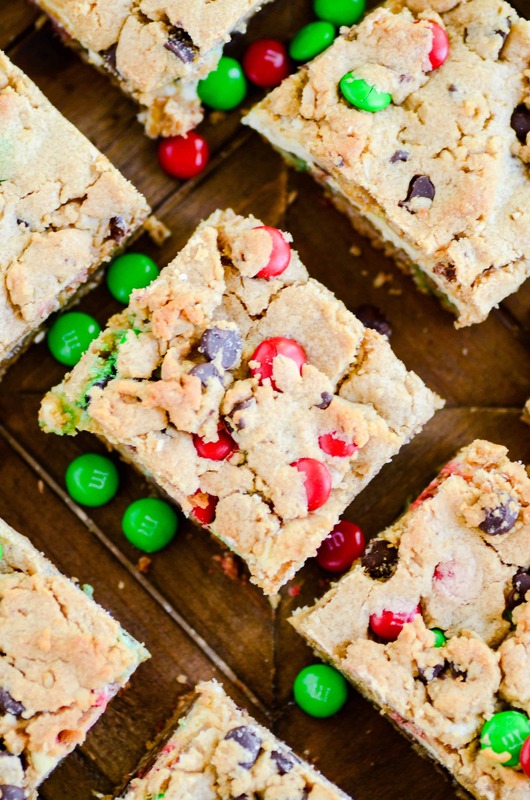 On top of the cheesecake layer you’ll add another layer of monster cookie dough. And it’s a lot simpler to do that it might seem. Just scoop out the dough and flatten it with your palms. Then layer the flattened dough across the cheesecake layer. It’s a beautiful thing ????. Chris and I about lost our minds over these (in a good way), and I’m confident you will too. Enjoy and happy holidays, my friends! And don’t forget to get your hands on a copy of Cheesecake Love. Preheat the oven to 350ºF. Lightly spray a 9x13 baking dish with nonstick spray and line with parchment paper. Beat together the butter, peanut butter, sugar, and brown sugar until creamy. Mix in the eggs, one at a time, the vanilla, and the salt. Add the baking soda, oats, and flour. Mix until dough forms. 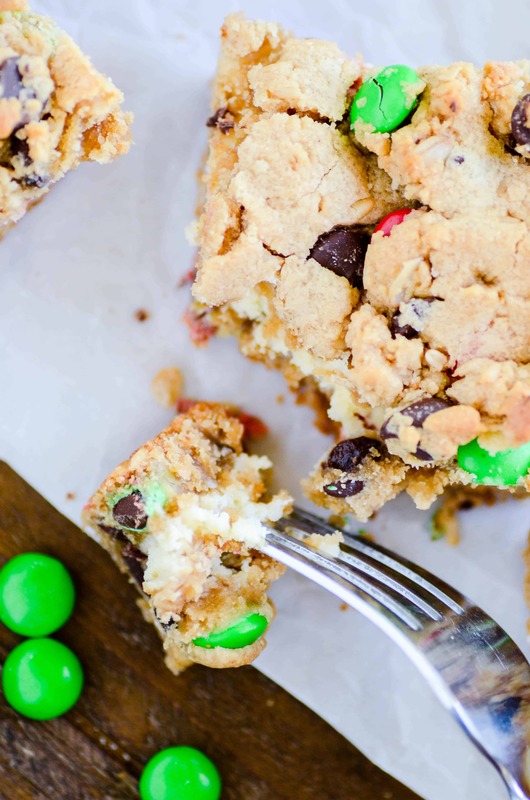 Mix in the chocolate chips and M&Ms by hand. Press half of the cookie dough into the prepared baking dish. Whisk together the softened cream cheese, sugar, and eggs until smooth batter forms. 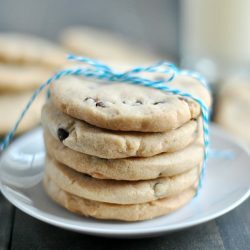 Pour the batter over the layer of cookie dough. Scoop the remaining cookie dough and flatten the pieces with your palms. 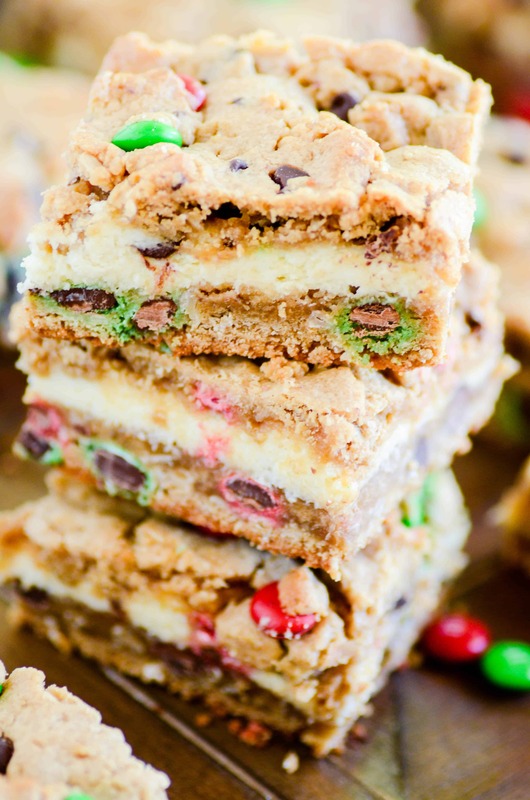 Lay the pieces of cookie dough in an even layer across the cheesecake layer. Bake for 35 minutes. Allow to cool at room temperature for at least an hour before refrigerating for at least 4 hours before serving.